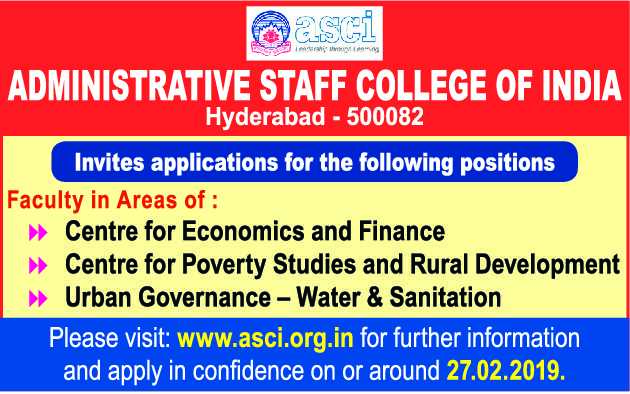 Administrative Staff College of India, Hyderabad has advertised in THE HINDU newspaper for the recruitment of Teaching Faculty- Professor / Associate Professor / Assistant Professor jobs vacancies. Interested and eligible job aspirants are requested to apply on or before 27th February 2019. Check out further more details below. About College: Established in 1956 at the initiative of the government and the corporate sector, the Administrative Staﬀ College of India (A S C I ), Hyderabad, has pioneered post-experience management education in India. A S C I equips corporate managers, administrators, entrepreneurs and academicians with the skills to synthesize managerial theory and practice; and respond to the ever-increasing complexity of managerial issues confronting government, industrial enterprises and non-government organizations. How to Apply: Interested and eligible candidates are requested to send application in prescribed format along with copies of certificates and recent passport size photo to postal address given below.